This support article has expired. Please view our new support console. If you have registered a domain name with another company you can still use it with your Netfirms account. The simplest way to do this is through a DNS transfer, where you continue to use the original registrar for the domain name, and you use Netfirms for your hosting. Domains are managed from the Domain Manager section. Click the Domains menu tab to access the Domain Manager. Select the Transfer tab to move the hosting to Netfirms. Enter the existing domain name under DNS Transfer. Click the Transfer button. If the domain exists and can be transferred, you will be presented with additional instructions onscreen to complete the installation. Point your domain name DNS Settings to Netfirms (see section 2.3 below). 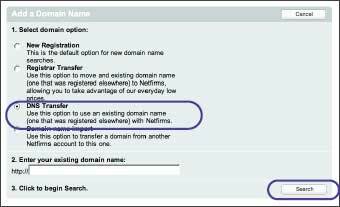 If you have added a domain name to your Netfirms account using the DNS transfer option, you need to point the DNS server information at your current registrar to Netfirms. The company that you originally registered the domain with can provide you the information on how to configure the DNS settings on their system.